Review Renu MPS Multi-Purpose Solution These was quite good but my vision without the contact lenses isn't great so I prefer the colour coded lenses cases. I only bought this item once but all in all it was good value, it just wasn't for me. Review Renu MPS Multi-Purpose Solution All good. Review Renu MPS Multi-Purpose Solution does the job well! Review Renu MPS Multi-Purpose Solution Very good solution, easy to use and cleaning nice. Review Renu MPS Multi-Purpose Solution A little expensive but it does what it says on the tin. Review Renu MPS Multi-Purpose Solution It is as good as it is. no drama, value is one problem we always find in Europe when I know you can get 500ml in the far east for as low as €5. Shame!! 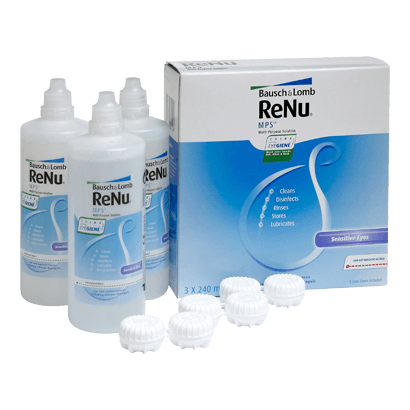 Review Renu MPS Multi-Purpose Solution Renu solution is excellent value for money, i use the sensitive eye solution & vision direct cannot be beaten on price. Carefully formulated to store, clean, rinse and disinfect soft contact lenses, Renu MPS Multi-Purpose Solution is a fabulous choice for sensitive eyes. Brought to you by Bausch and Lomb, one of the world's largest suppliers of soft contact lens and lens care products, this all-in-one contact lens solution is as gentle as your naturally occurring tears.